BANGOR, MAINE - April 7, 2017 – Husson University students, faculty, staff, alumni, and members of the community filled the Gracie Theatre today to celebrate the generosity of the Harold Alfond Foundation. The event featured tributes delivered by U.S. Senator Susan Collins, Husson President Dr. Robert A. Clark and Greg Powell, Chairman of the Harold Alfond Foundation as they announced the Foundation’s $4 million matching gift toward the construction of a new College of Business building on Husson University’s Bangor campus. The fundraising goal for this project is $16 million. Approximately, $1.7 million has been given or pledged to this project already. In an effort to encourage additional donations, the Harold Alfond Foundation will provide a one dollar match for every two dollars donated to Husson for this project, up to a total of $4 million. 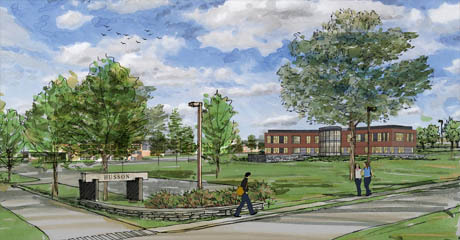 Husson also envisions a cross pollination of science and entrepreneurship in unique 360-degree classrooms dedicated to innovation. The building will feature interactive learning spaces designed to foster interdisciplinary learning. For example, a new facility in the building dedicated to the creation and marketing of virtual reality applications will enhance collaboration between the College of Business and Husson University’s New England School of Communications. This high-tech learning environment will be dedicated to creating virtual reality applications and testing outcomes with real-world business applications. A $1 million gift from an anonymous donor in 2016 will make this space possible. The University has seen how the addition of new facilities can positively affect enrollment. When the Ronan Center for Financial Technology was added to Husson University, enrollment in finance-related concentrations increased by 58 percent over a two-year period. The addition of this new building to Husson University’s campus is anticipated to have a similar effect on all College of Business programs. Once the new building is connected to the Richard E. Dyke Center for Family Business, there will be greater opportunities for synergy between the two facilities. Students will have enhanced access to seminars, special programs, networking opportunities, and interactions with family business leaders. The combined facility will be ideally suited to provide a creative convergence of educators, business leaders, entrepreneurs, and students. Students will gain additional opportunities for experiential learning and develop an enriched understanding of the business issues affecting Maine, because of this synergy. “This gift ensures that Husson University will maintain its leadership role as Maine’s leading center of business education. Students attending the College of Business make up a sizable portion of Husson University’s student body. In fact, 40 percent of Husson University students are enrolled in College of Business programs. Providing them with the facilities and technology they need to achieve career success, regardless of their prior economic circumstances, is central to our mission,” added Clark. There continues to be increased interest in Husson University business programs. While overall admissions at Husson University were up 8.3 percent during the Fall 2016 semester, admissions into the University’s College of Business grew 14 percent during the same period. This was part of a 32 percent overall increase in the number of students enrolled in College of Business programs over the past five years. This is not the first time the Harold Alfond Foundation has supported projects at Husson University. A major grant from the Foundation helped create the Harold Alfond Diamond and the Winkin Sports Complex. Husson’s football, baseball, and field hockey teams use these athletic facilities. This grant funded the first artificial turf field at Husson, substantially improving the condition, safety and usability of these fields and enriching and improving the athletic experience at the University. In addition, Husson awards Harold Alfond financial aid scholarships to approximately 30 students each year. Founded in 1950, the Harold Alfond Foundation furthers the philanthropic legacy of Harold Alfond, the founder of Dexter Shoe Company and a longtime supporter of Maine communities in which he and his family worked and resided. He ensured that his philanthropy would live on by committing nearly all of his wealth to the Foundation, which continues to support charitable causes in the State of Maine. Consistent with Harold Alfond’s own giving pattern and philanthropic principles, the Foundation favors education, healthcare, youth development, and other selected charitable causes. For more information, visit HaroldAlfondFoundation.org.